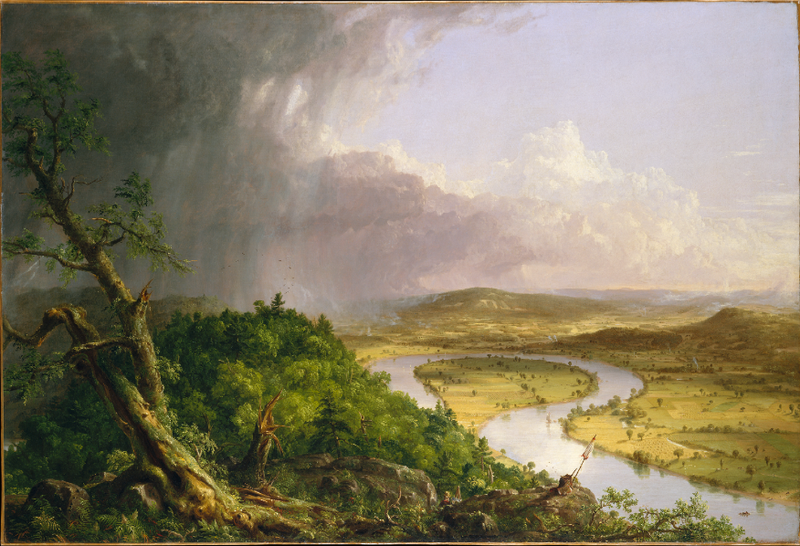 The scene must have resembled that depicted by Thomas Cole in his famous 1836 painting View from Mount Holyoke, Northampton, Massachusetts, after a Thunderstorm – The Oxbow. The novel is not one of James’ best, but the moment is poignant. And it’s hard not to think that James himself, during his 1864 visit, also lay under the shadows of Mount Holyoke and looked out over the meadows of Northampton, torn between appreciation for their immense possibility and resentment of their parochial charm. Both Henry James and Northampton were much on my mind this past spring. In March, my essay “The Lost Meadows of Northampton” was published by The Massachusetts Review, and later that month I read Michael Gorra’s Portrait of a Novel, a moving account of James and the writing of his most famous work, Portrait of a Lady. Then, in April, spurred on by Gorra’s book, I read The Golden Bowl, James’ final novel, while on a two-week trip to the North Carolina mountains. 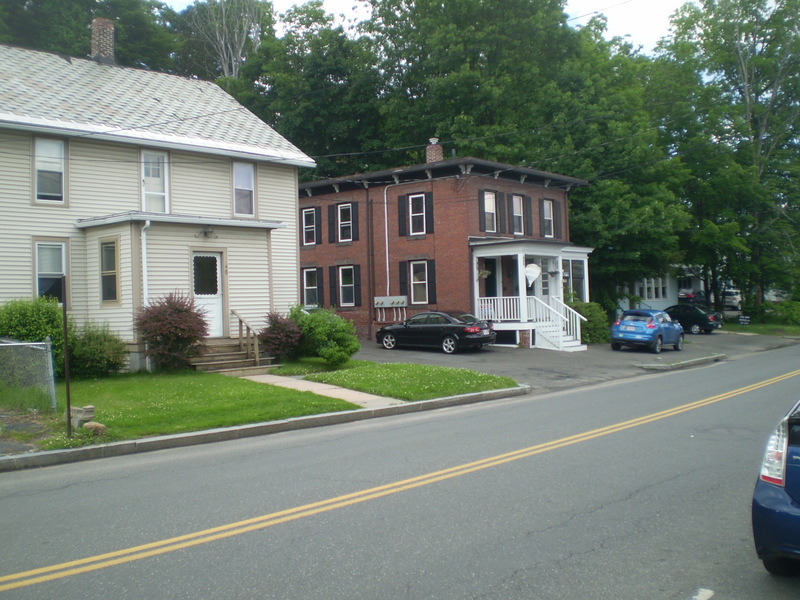 The two books got me thinking about the writer’s 1864 visit to Northampton, and when I got home from the mountains, I did a Google search to see if anything had been written about it. That’s how I found Flower’s essay, “Henry James in Northampton: The View from Prospect House,” published in 1985 in The Massachusetts Review. In the piece, Flower quotes from the opening chapter of Roderick Hudson, the passage where Mallet and Hudson sit and talk by the Connecticut River that lovely late summer day. My first reaction was that I had missed a chance to include James in my own piece about Northampton. The scene overlooking the meadows would have been a nice touch. The next thing that struck me was Flower’s account of James’ second visit to Northampton, which took place more than 40 years after the first. In May, 1905, the now famous writer, a full-time resident of England, gave a lecture on Balzac at Smith College. He had been in the United States since August of the previous year, visiting family and friends and recovering from the exertions required to finish The Golden Bowl. It was his first visit to the country of his birth in two decades. He stayed with Edith Wharton in the Berkshires, touring the region in her new motor car; he met President Theodore Roosevelt in Washington, DC; and he gave his Balzac lecture to audiences in Philadelphia, St. Louis, Chicago, Los Angeles, and Seattle, before returning to the east coast in the spring of 1905. The Smith College stop was one of the last of the trip. Flower’s essay includes several photographs taken of James in Northampton. In them, he appears clean shaven and well dressed. In some, he is wearing glasses; in all, he is an imposing figure. The photographs are beautifully lit and elegantly posed. They were taken by Katherine E. McClellan, who had a studio in Northampton from 1903 to 1918 and was later the official photographer of Smith College. 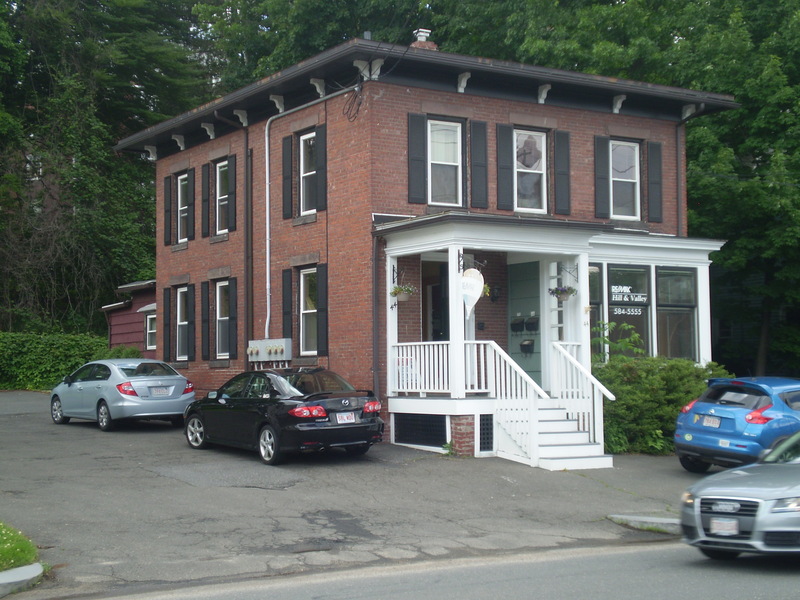 The studio, Flower writes, was at 44 State Street. I know State Street well; I walk it on my way to Smith College to study on the weekends; it’s also the location of some of my favorite stores: State Street Fruit and Wine, Serio’s Market, the Hungry Ghost Bakery. A quick look at Google Maps showed that 44 State Street is, in fact, right across from State Street Fruit. The building there now is a Re/Max real estate office. One day I walked by and took a picture. Could it be that in this building Henry James was photographed in 1905? Had he walked down Bedford Terrace from Smith College as I have done so many times, turning right on State Street in the direction of the town center? Did he look up that spring day at the beautiful green trees which line the street, then as now? The house at number 44 appeared to be at least a hundred years old, but when I consulted old maps, there was no 44 State Street on any of them. 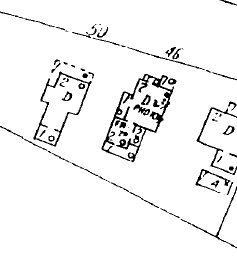 There were buildings at 42, 46, and 50 State Street. But not at 44. 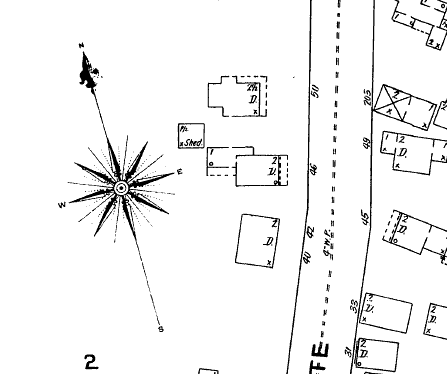 Using the online resources of UMass Amherst Libraries, I found the street on five different maps of Northampton (from 1895, 1902, 1910, 1915, and 1930), all produced by the Sanborn Map Company, which published fire insurance maps in the nineteenth and twentieth centuries. 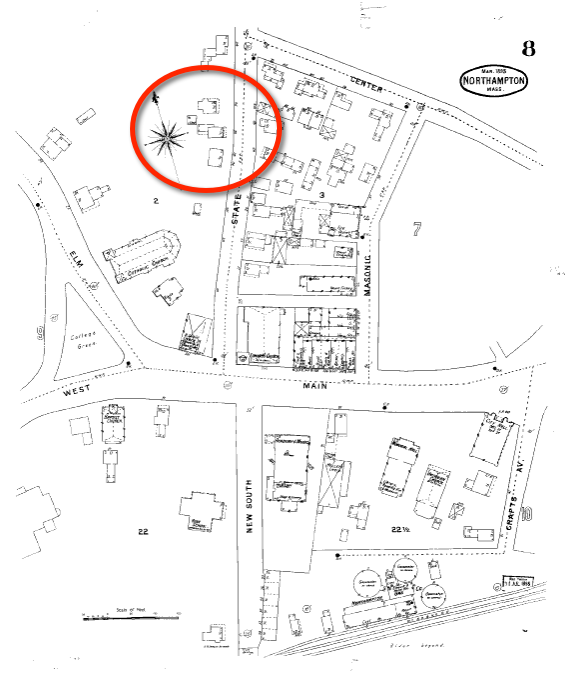 Here’s State Street from the 1895 Sanborn map, sheet 8, with the area in question circled in red. When you zoom in, you can see the buildings at 40/42, 46, and 50 State Street. They must be the buildings currently at 40, 44, and 50 State Street, right? But if so, why is the middle one numbered 46 in the Sanborn maps? Is it Katherine McClellan’s former photography studio? 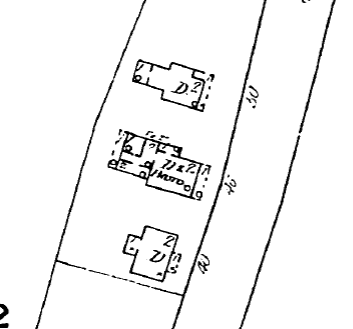 On the 1910 Sanborn map, sheet 13, the same three buildings are shown, but now something is written inside the building at 46. Does it say “PHOTO”? So, the building currently at 44 State Street does indeed appear to be Katherine McClellan’s former photography studio, where Henry James had his portrait taken in 1905. Why it’s numbered 46 in the Sanborn maps I don’t know. Of course, I could have solved the puzzle much sooner by simply calling the Smith College Archives, which I eventually did. 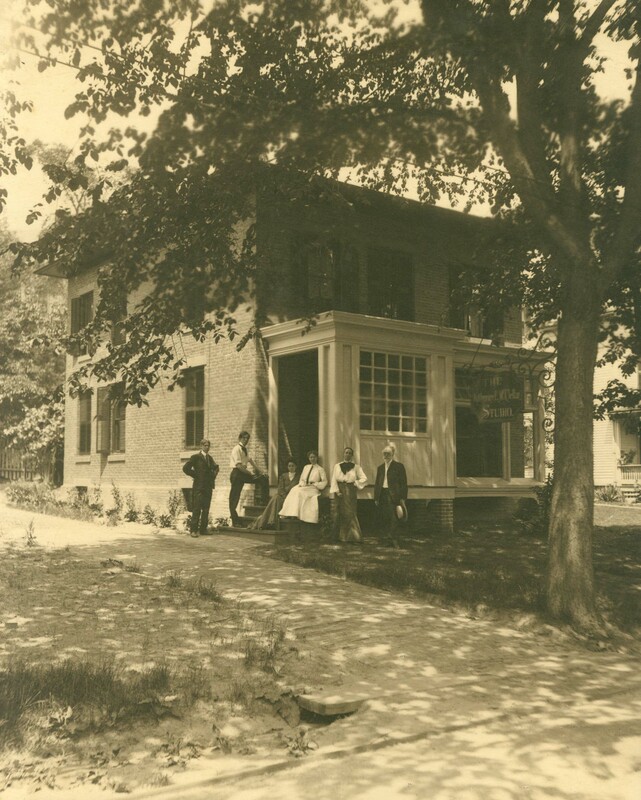 Nanci Young, the archivist there, confirmed that McClellan’s studio was at 44 State Street and that the building still stands, now a real estate office. 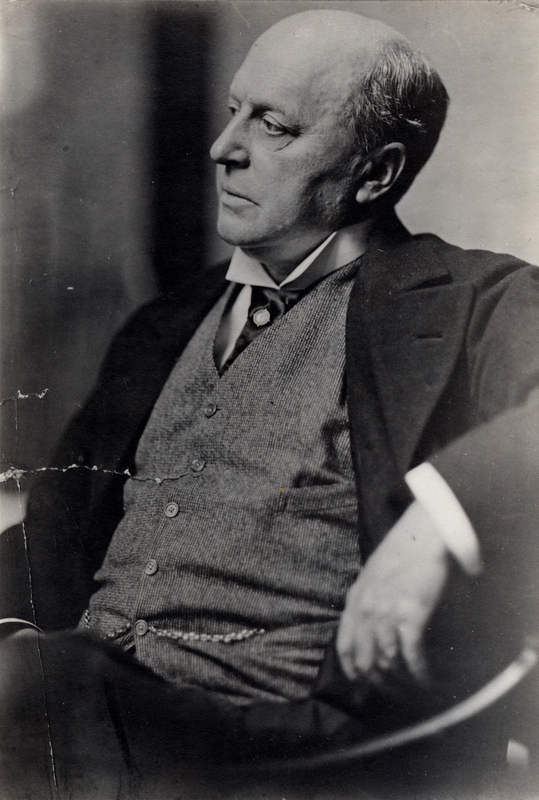 Young gave me permission to publish the photograph of Henry James that appears above. And she also located for me a photograph of McClellan’s studio, shown here. Clearly, this is the same building that stands there now. And, if you zoom in (or look at the larger version of the photograph that appears at the top of this post), you can make out the sign hanging in the front: The Katherine E. McClellan Studio. I don’t know for sure, but I think that’s McClellan herself in the group of people outside, second from the right. It looks like a lovely summer day in Northampton, the shadows from a tree dappling the driveway. The photographs of Henry James and Katherine McClellan’s studio are reproduced courtesy of Smith College Archives, Smith College. The Thomas Cole painting is from the Metropolitan Museum of Art in New York City, a gift of Mrs. Russell Sage in 1908. For more on Katherine McClellan, click here and here. This entry was posted in inquiring. Bookmark the permalink. Your site is so rich, David. This post beautifully illustrates how place is a topos for critical and creative thought about about time as well. Lots to ponder here. Nice. You might also add Bryant’s sonnet “To Cole, the Painter, Departing for Europe” to this mix. katherine McClellan and her sister daisy developed Mcclellan Park area in Sarasota Florida in 1916..